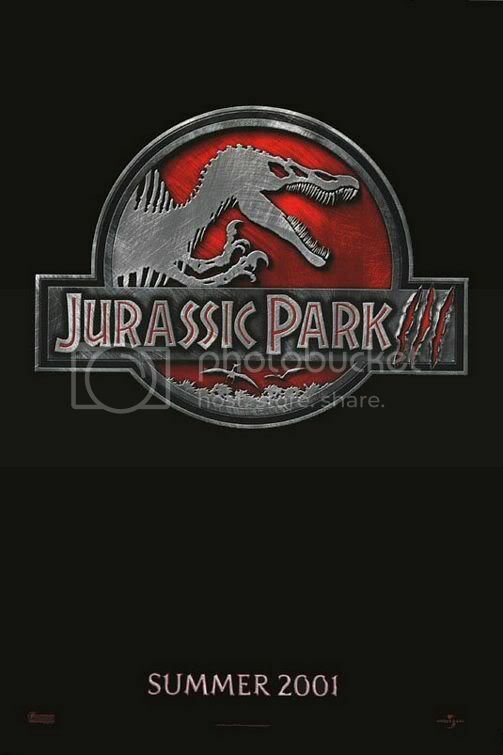 Watching Jurassic Park III in the theater, as a high-schooler, with a friend, as a fan of the previous iterations (especially the books, but even enjoying the poorness of The Lost World: Jurassic Park), I did enjoy the film. There were dinosaurs, and they chomped on people. There were new dinosaurs, and new people, and one familiar face, and that was about it. I realized that it wasn’t a great film, but I did enjoy it. Watching it again now it becomes apparent that it wouldn’t have had a theatrical release if it hadn’t had “Jurassic Park” in the title and been executive-produced by Steven Spielberg. Nine years after its theatrical run it looks like a SyFy movie-of-the-week, with poor dialogue, a terrible script, stupid characters, and rather weak special effects. The plot is standard and cookie-cutter. A group of people get stuck on an island that’s overrun with dinosaurs. 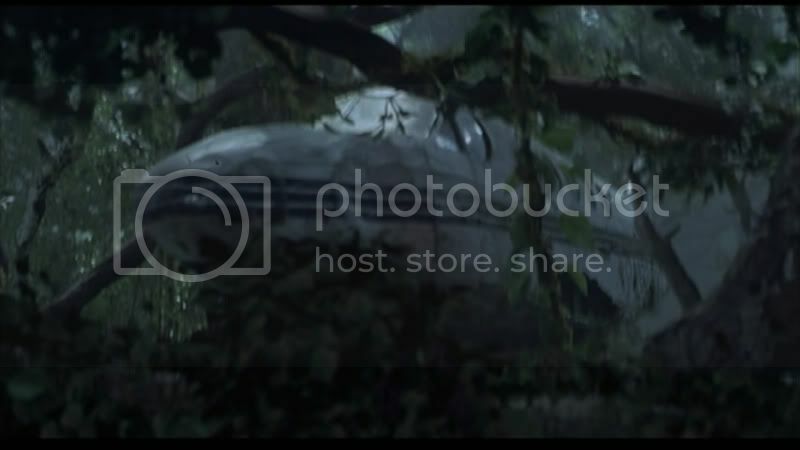 But this is the second island from the original Jurassic Park movie [review here], and referenced in The Lost World: Jurassic Park. 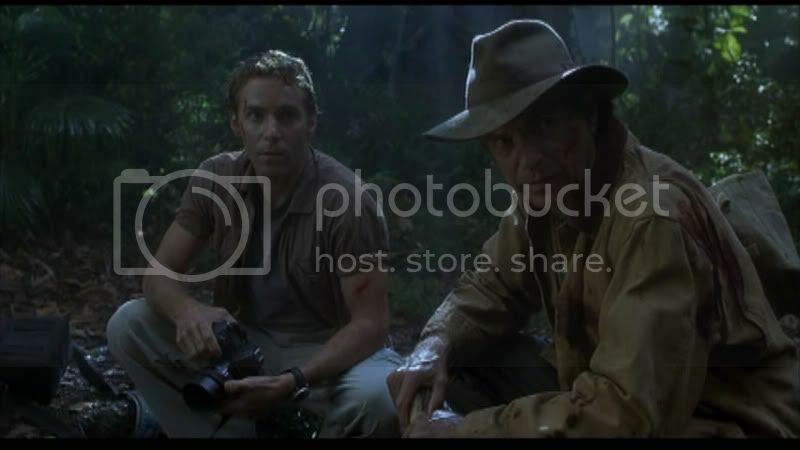 Therefore, the film re-introduces Dr. Alan Grant (Sam Neil), the paleontologist who suffered through the island the previous two times. A brief scene reunites him with Dr. Sattler (Laura Dern), the paleobotanist from previous outings. She has married another man and has an adorable young boy, so we know that this is her cameo and nothing more. Dr. Grant gives a grand lecture about how dangerous velociraptors are, how their powers of communication are vast, and how they would rule the world if they hadn’t been wiped out. But the audience is only interested in his experiences on the island, which have evidently hit the press. Or at least the San Diego press, when the T-Rex landed there. Dr. Grant swears he’ll never go back to the island again. This would be a very short film indeed if he were right. As it is, he’s approached by a very wealthy couple asking for a flyover tour of the second island. They are adventure seekers, Paul Kirby (William H. Macy) and his wife, Amanda (Téa Leoni), and want to see some of the creatures from the air. Dr. Grant reluctantly agrees, seeing as they offer to fund his current dig for another decade. He takes along his young sidekick, a Shia LaBeouf-lite character before Shia became famous. His name is Billy (Alessandro Nivola) and he’s a bright kid. Approaching the island it becomes apparent that the couple is not just hoping for a fly-over, but instead expects to land their small plane on the island. Fortunately they had the foresight to bring along two mercenaries and another hired goon. Their goal turns out to be a rescue of their son, who was stranded on the island while parasailing. But all is not what it seems, not even the CG dinosaurs who look surprisingly unreal. The movie gets off to a rocky start when even the parasailing green screen looks rather poor. When the first dinosaur appears, some large creature called a Spinosaurus, it is evident the same amount of time was not given to creature creation in this iteration as it was in Jurassic Park. The grandest battle of the movie, involving two lumbering beasts, occurs a mere third of the way through the run time. Fortunately the movie is rather short, at an hour and a half (even less without credits) and it does move along at a crisp rate. There are a great number of “ah-ha” moments, when the camera zooms in on Dr. Grant just as he turns his head and utters a grand phrase, usually involving the dinosaurs evolving. There are a number of memorable lines, including the likes of “I rescued your hat.” But the biggest disappointment comes not with the poor dialogue and wretched story. All sense of wonder is lost, until a scene very near the end. There’s no grand reveal of these enormous beasts, no moment of realization when it becomes apparent they really are walking on the earth once more. Instead the movie becomes a game, making the audience wonder what type of dinosaur will be revealed next, and who will be its dinner. There is still campy fun to be had. It’s good to laugh at the poor special effects, varying between the Stan Winston-produced animatronics to the wretched CGI, though the humor grows old after a while. There are some name actors involved, in what can only be explained as a payday, and it is amusing at times to laugh at their predicament, as actors and not as dino-dinner. In spite of the rather harsh review, I hold a bit of a soft spot for the film. It consists of dinosaurs, on an island, killing off a small band of survivors, and this is the basis for the most simple and effective type of adventure story. If only there had been more adventure, more wonder, more unforced excitement, and a little less stupid talking. This entry was posted in 2 pirate flags, 2 stars, J, Movie Reviews, Pirate Flag Rating, Star Rating on April 18, 2010 by Tim Irwin.